Show after show at the Lakme Fashion Week Winter/Festive 2014 I felt I wanted to see something different, but was offered the tried and tested hour after hour. Finally, my wait as rewarded on Day 3 during Sreejith Jeevan’s show for his brand ROUKA. The collection titled ‘Strung Together’ inspired by the garland makers from a small temple town in the southern part of the country, Sreejith showed the world how a simple thought can translate into sheer magic. The collection as he said was inspired by women who sold flower garlands in little wicker baskets near the temples in south India. He said the collection was his tribute to these simple women for adding fragrance to many lives. 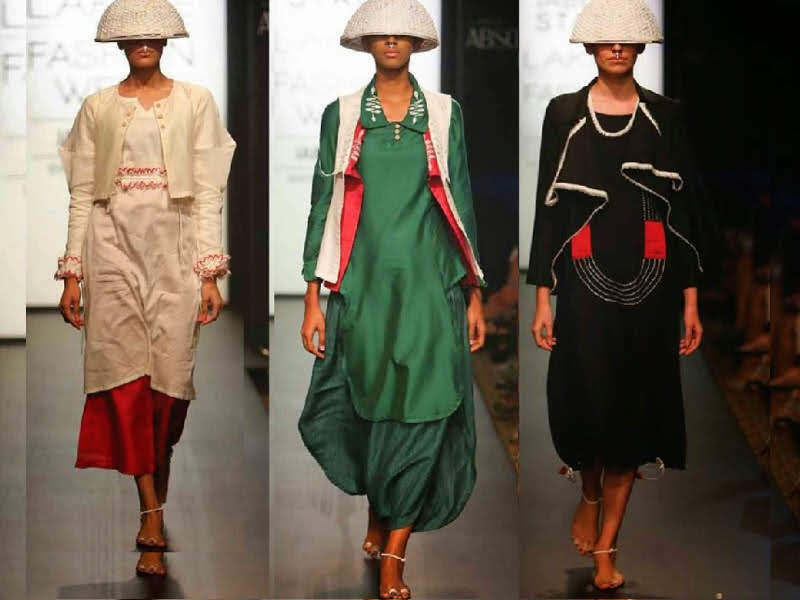 As the models walked down the ramp wearing handmade baskets over their heads what drew me in was the unique style of craft that bridged the indo-western divide. With its exquisite material blend and fine silhouettes, the collection brought together a fun element for the festive season in its colourful finery. 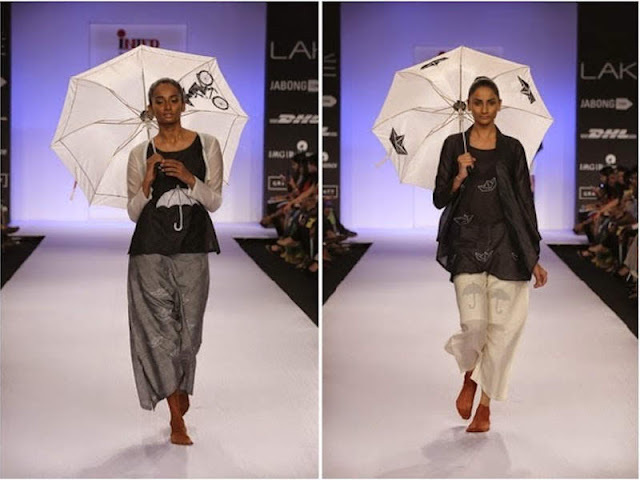 The word ROUKA with different meanings in two languages- Bodice in Malayalam and Corridor in Japanese, ROUKA projects an outlook for the modern eclectic woman. Just as it snugly exists in two diverse languages yet fits perfectly into both the worlds, the Rouka woman does not need to choose between any two as she fits into varied worlds beautifully completing it as a whole. Surfing the brand site Sreejith’s credentials impressed me even more. With a textile degree from the National Institute of Design in Ahmedabad and the Ecole Nationale Superieure Des Arts Decoratifs in Paris, he aims to make his brand a memorable voyage, working with craftsmen to co-create unique products that are functional fashion. As I sat marvelling at his earlier collection ‘Weather Forecast’ full of interesting motifs of paper boats, old umbrellas and ambassador cars it felt like I was playing in God’s own country as raindrops drizzled all over my body. The high for the designer and the brand is that they up the ante with every turn. Sreejith fashion film ‘Strung Together’ went on to win the second edition of Fashion Films Forum, adjudged by celebrity stylist and Vogue’s fashion director Anaita Shroff Adajania. Rightly so it was by far the best film screened. Wonderfully encapsulating the spirit of his collection, the film was set with traces of south Indian brilliance. Carnatic recital with Bharatanatyam movements, hands weaving fresh flower garlands as ghungroo-clad feet joined the symphony… it was perfectly staged for a consummate city girl to discover the joy of exploring a temple town. Sreejith’s originality and organic integration of inspiration and style is something to watch out for in the Indian Fashion Space. Rouka is like a breath of fresh air in the tiresome garden or should I say a beautifully strung together garland of fresh fragrant flowers. Don’t miss this fascinating designer and his creations; stay connected with him on Facebook and Twitter. Stay tuned for some amazing initiatives we've lined up with Sreejith at iCynosure. Some of those styles are really different! I quite like them to be honest!